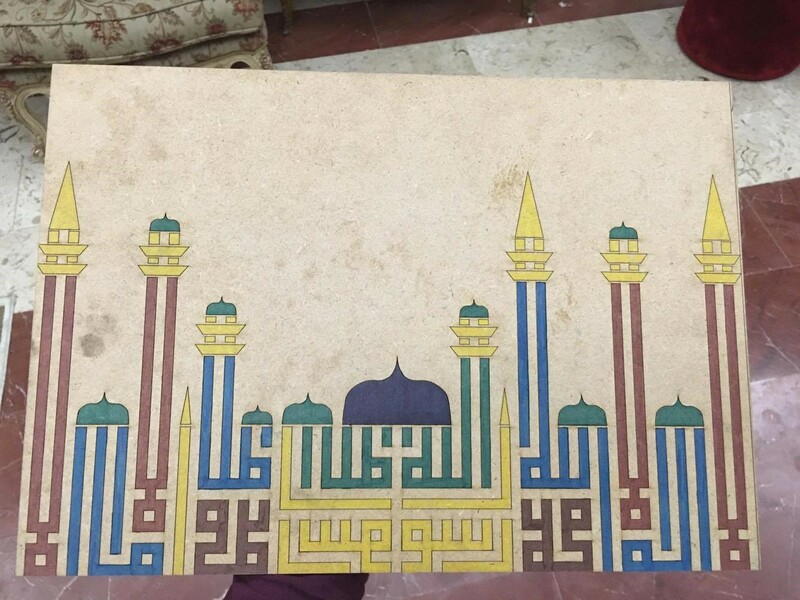 The artwork that I have produced is a drawing of a mosque using Kufic calligraphy. I engraved my drawing on an A3 wooden board that is 42cm x 29.7 cm. Nowadays the perception of Islam has diverged from being a religion of love and peace into being viewed as a religion that encourages hate and ignorance. This change might have been caused by either the way media broadcasts the news or the emphasis on terrorist attacks done mostly by the Muslim extremists. I believe that one of our missions in life is to spread love and peace. Regardless of our origins, beliefs or religion, we should all spread love and care. Our morals and the anticipated humane acts do not belong to any certain religion. A human is expected to help a friend in need, donate money to the unfortunate and make the world a better place. You do not have to be religious person to be a good person. However, in order to be a good person decisions should be based conscious and a person’s own judgement. Moreover, these morals are further emphasized in the religions we belong to. Religions that we have inherited, chosen or denied. Thinking about it, the teaching of all religions basically state the same things; don’t kill, don’t steal and don’t hurt a soul. However, these teachings have been categorized in many ways and this has later on further developed into religions. The main reason behind religions was to organize human life and to acknowledge people of a divine power that has created them and all the marvelous creations in their surroundings. Religions have long been accepted by people and were followed as a mean to comfort oneself and protect the soul from being lost in this wild and mysterious universe. The human mind, no matter how advanced or unlimited it can think, no one ever has been able to interpret the world we live in. It is such a beautiful and enigmatic world. Humans are either blessed or cursed to have such a curious mind, a mind that nourishes on thinking, exploring, discovering and expanding. This mind can never be limited with boundaries nor restrictions that will only hinder its thinking process. Any person is free to think the way they want to and accept or deny what they have concluded. According to my own interpretation of peace, reaching the stage of being content with yourself, your beliefs and lifestyle is happiness itself. This happiness escorts you to the highest level of peace. Peace with oneself, with the others and the surroundings in general. In order to produce such an artwork or to reach such an idea, I had to review the work of many artists. I was particularly interested in mixing media. I did not want to write a plain Kufic script nor just produce a painting. Therefore, I combined calligraphy with geometry to produce such a piece that is visually interesting. Kufic calligraphy has a deep symbolism in Islam. This is because it is a beautiful font to write the Quran script with. Kufic calligraphy usually gives the vibe or feel of geometry, lines and edges. This gives the viewer a sense of organization and order. Mosques are said and have long been believed to be the “houses of God”. In mosques, Quran is recited the whole time, prayers are called for five times a day and Islamic gatherings are held frequently to keep the people connected with their creator. All of this created within the mosque boundries a comfort zone or a peaceful environment for the Muslims. Thus, according to Muslims at least, mosques are directly linked with peace and inner happiness. Calligraphy was initially developed as a way to beautify Qur’anic scripts, that’s why calligraphy was mostly seen in mosques and prayer areas. It was and still is used as a way to decorate mosque walls. Therefore, combing calligraphy, Kufic calligraphy in specific with the mosque drawing seemed to be a very interesting and exciting idea. El Seed was my main inspiration. Although his work is not as geometric as the one I have produced, I was inspired by him. El Seed took calligraphy to a whole new level and this is why I like him. 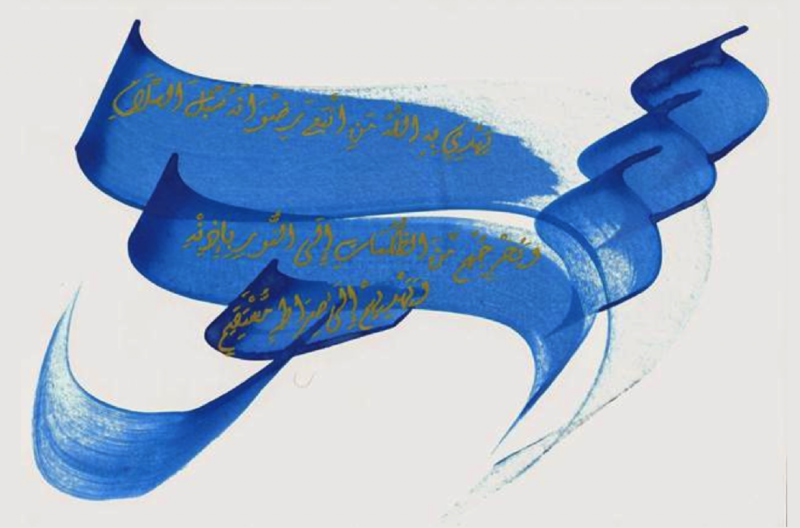 He did not restrict calligraphy to Islamic scripts but has rather expanded it to Arabic sayings and phrases. Also, El Seed always tried to deliver a message through his work and this makes the art piece even more worthy and deep. In my project I tried to include his colorful spirit and vibe into my shapes. I also, like him, tried to mix media and not stick to one type only. I called my artwork “tawheed.” Tawheed is what Muslims say when they want to seek God and look for comfort. Tawhid is the religion's most fundamental concept and holds that God (Allah), is One and Single and that Mohamad( Peace be upon him) is his prophet. These words are mostly glorified by Muslims and Muslims have to admit this belief every day in their prayers. These words can also be called “Shahada,” and they are recited by Muslims during every prayer. I am an interior design student. I am particularly interested in Arabic language and Calligraphy. I am on a life time mission that aims to deconstruct all the stereotypes built by non-Muslims about Islam and Muslims. 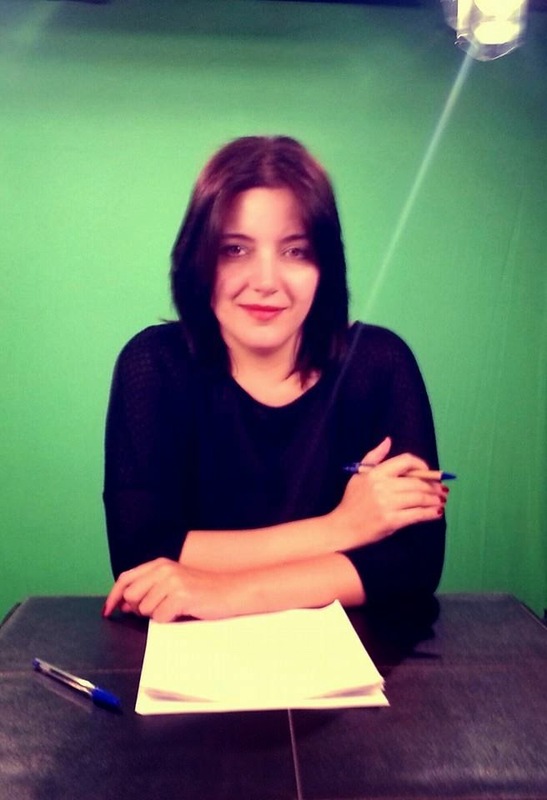 I also try to revive the Arabic and middle eastern culture that tends to be forgotten by many youth people my age.